In the last few weeks we have recalled how Tazewell County was founded and named, and how the county boundaries were redrawn during the 1830s and 1840s. As we noted previously, Tazewell County was named for a Virginia state governor and U.S. Senator named Littleton Waller Tazewell. But what of the names of the other 101 counties of Illinois? Where did they get their names? Starting today and continuing over the next few weeks, we’ll present the counties of Illinois in order of their founding, telling the years they were established and the origins or meanings of their names. Most of our state’s counties were named for notable men of U.S. and Illinois history. St. Clair County was established in 1790 when Illinois was a part of the Northwest Territory. It was named for Maj. Gen. Arthur St. Clair (1737-1818), first governor of the Northwest Territory. Randolph County was established in 1795 during the time when Illinois was part of the Northwest Territory. It was named after Edmund Randolph (1753-1813), the first U.S. Attorney General as well as a U.S. Secretary of State. Three counties were founded in 1812, three years after the formation of the Illinois Territory: Gallatin County, named for Albert Gallatin (1761-1849), the fourth U.S. Secretary of the Treasury (and the one who served the longest); Johnson County, named for Richard Mentor Johnson (c.1780-1850), ninth U.S. vice president and a U.S. senator from Kentucky; and Madison County, named for President James Madison (1751-1856). 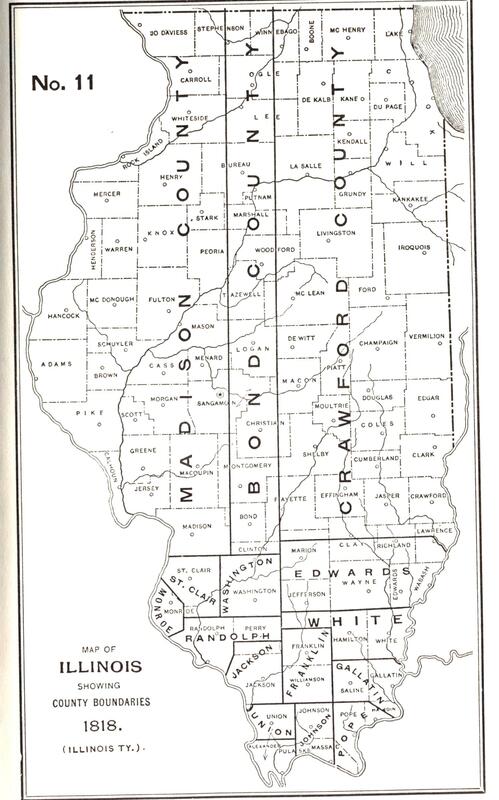 In 1814, Edwards County was formed, named after Illinois Territorial Gov. Ninian Edwards (1775-1833) who later served as Illinois’ third state governor. The city of Edwardsville, county seat of Madison County, is also named after Ninian Edwards. White County was formed the following year, being named for Isaac White (1776-1811), an Illinois settler who joined the Indiana Territorial Militia and was slain at the Battle of Tippecanoe. The next year, in 1816, Crawford County was founded, named after William H. Crawford (1772-1834), ninth U.S. Secretary of War and seventh Secretary of the Treasury. Also founded in 1816 were Jackson and Monroe counties, named for Presidents Andrew Jackson and James Monroe (it was Monroe who would admit Illinois to the Union two years later), and Pope County, named for Illinois Territorial Delegate Nathaniel Pope who played a central role in getting Illinois admitted as a state. 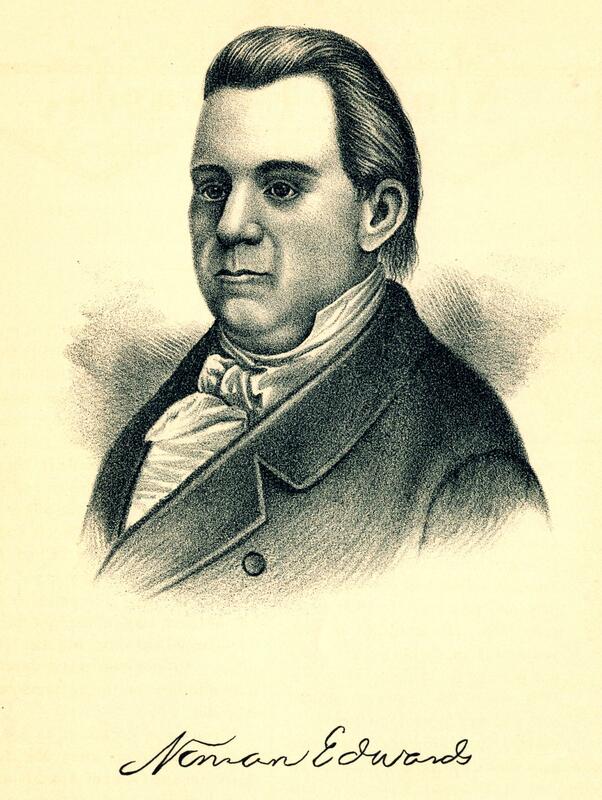 Then in 1817, Bond County was formed, being named for territorial congressional delegate Shadrach Bond (1773-1832), who would be elected the first Illinois state governor just one year later. Three new counties were formed in the preparation for Illinois’ admission to the Union as the 21st state in 1818, which explains the very patriotic names they were given: Franklin County, named after the famous Founding Father Benjamin Franklin; Union County, named in honor of the national Union of the states; and Washington County, named for the first U.S. President George Washington. This map, from the “Origin and Evolution of Illinois Counties,” shows the boundaries of Illinois’ counties at the dawn of statehood in 1818. The year after Illinois statehood, 1819, saw the creation of four new counties: Alexander County, named for William M. Alexander, a pioneer settler of Illinois who was elected to the Illinois General Assembly; Clark County, named for George Rogers Clark who led the Illinois Campaign during the Revolutionary War; Jefferson County, named for Founding Father Thomas Jefferson, the third U.S. president; and Wayne County, named for Gen. Anthony Wayne (1745-1796), who fought in the Revolutionary War and the Northwest Indian War. In 1821, the state legislature created seven new counties: Fayette, Greene, Hamilton, Lawrence, Montgomery, Pike, and Sangamon. The county seat of Fayette County is Vandalia, second Illinois state capital (1820-1839). The current state capital, Springfield, is also the Sangamon County seat of government. 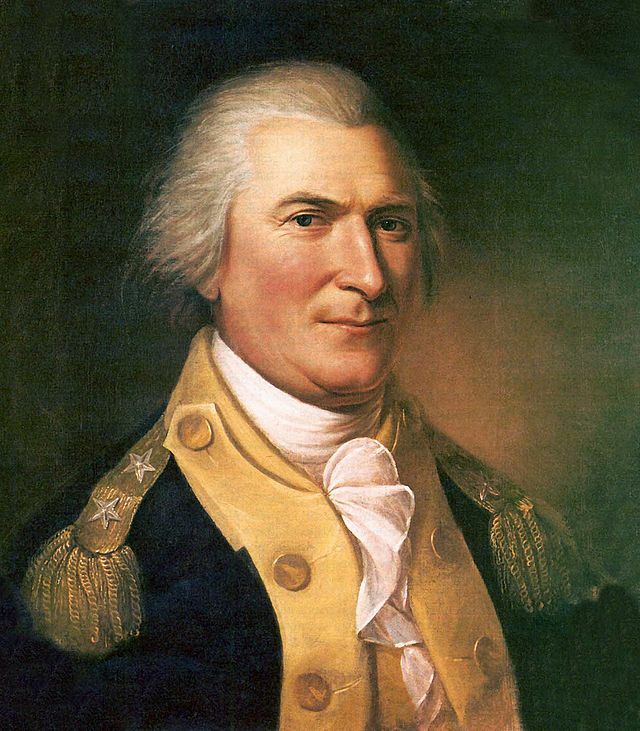 Greene County was named for Nathanael Greene (1742-1786), a Revolutionary War major general. Hamilton County was named after Founding Father Alexander Hamilton, first U.S. Secretary of the Treasury (Hamilton’s son William, a pioneer settler of Springfield and Peoria, was one of the dignitaries who met Lafayette at Kaskaskia in 1825). Lawrence County was named for Capt. 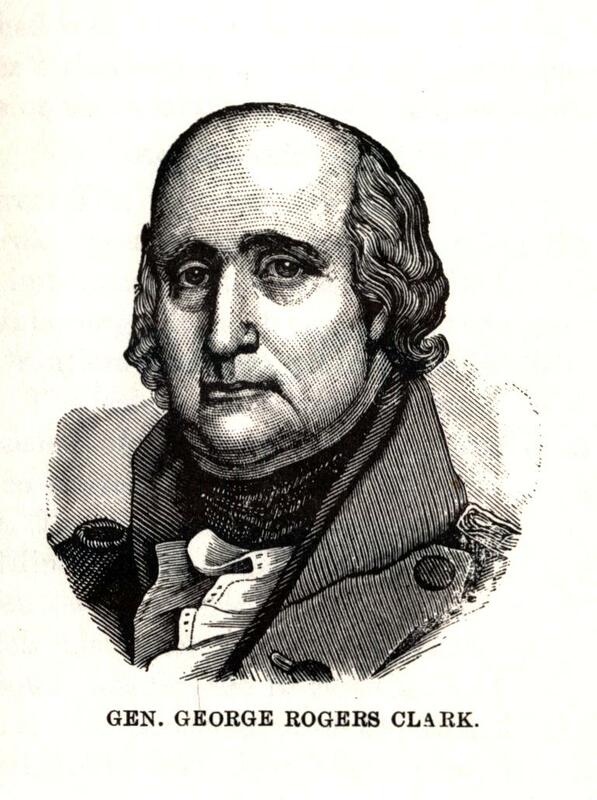 James Lawrence (1781-1813), commander of the U.S.S. Chesapeake in the War of 1812, remembered for his command, “Don’t give up the ship!” Montgomery County was named for Gen. Richard Montgomery (1738-1775), a Revolutionary War leader who led a failed American invasion of Canada. Pike County is named after the explorer Zebulon Pike (1779-1813), after whom Pikes Peak in Colorado is named. Finally, Sangamon County is named for the Sangamon River that flows through it. “Sangamon” comes from a Pottawatomi term, Sain-guee-mon, meaning a place where food is plentiful. Four more counties were added in 1823: Edgar County, named for John Edgar (c.1750-1832), a very wealthy settler who served as an Illinois delegate to the Northwest Territory’s legislature; Fulton County, named after Robert Fulton, the famous inventor of the steamboat, which greatly aided Illinois commerce and transportation; Marion County, named in honor of Revolutionary War Gen. Francis Marion (c.1732-1795); and Morgan County, named after Revolutionary War Gen. Daniel Morgan who later served as a U.S. Congressman for Virginia. That brings us to the eve of the arrival of Pekin’s first pioneer settler Jonathan Tharp in 1824 (the future site of Pekin was then in Sangamon County), which is a convenient place for us to pause. Next week we’ll continue with the three counties founded in 1824 – Clay, Clinton, and Wabash counties. Following the conclusion of George Rogers Clark’s Illinois Campaign in 1779 during the Revolutionary War, peace would reign over the wider Illinois Country for the next three decades. During that period, off to the east the Ohio Country was the theater of numerous battles during the Northwest Indian War, and while Native Americans from Illinois joined in the fighting in Ohio, Illinois itself was not a field of battle. That long peace, during which several Ohio tribes began cultural accommodation with white Americans, would be broken a mere three years after the 1809 formation of the Illinois Territory, with the outbreak of the War of 1812, at which time war returned to Illinois. But given the state of affairs in the territories of Indiana and Illinois in the years leading up to the United States’ declaration of war against Britain, it was inevitable that Illinois would also be caught up in bloodshed. Illinois was caught up in war at that time as a consequence of an important treaty that Indiana Territorial Gov. William Henry Harrison had negotiated with a number of Indian tribes of Indiana and Illinois in 1809 – the same year that the U.S. Congress separated the Illinois Territory from Indiana and erected it as a separate territory. Throughout his time as territorial governor of Indiana, Harrison had pursued a consistent policy of negotiating treaties to open up more Native American land for European-American settlement. One of the most important of his treaties was the Treaty of Fort Wayne (also known by the nicknames of the Ten O’Clock Line Treaty or the Twelve Mile Line Treaty), initially signed Sept. 29, 1809, only seven months after the Illinois Territory was separated from Indiana. Through this treaty, the U.S. acquired 3 million acres of land in Indiana and Illinois – but the treaty caused great unrest among the Native American tribes of these territories, soon leading to war. 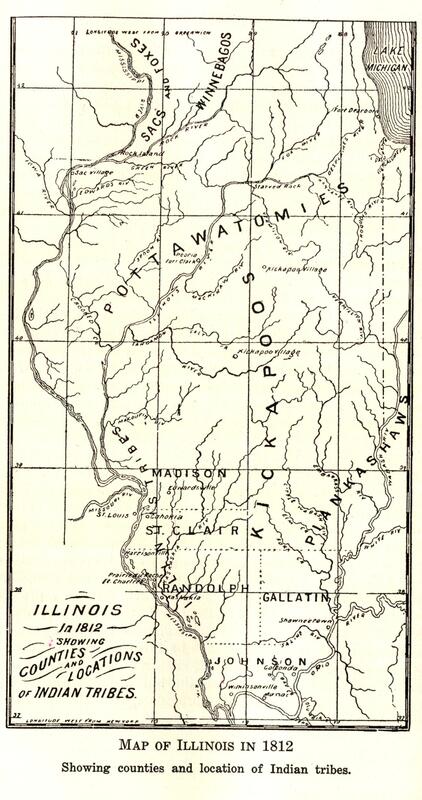 The difficulty was that at the outset, three important tribes, the Kickapoo, the Wea, and the Miami, were absolutely opposed to selling any more of their land near the Wabash River. Contrary to President James Madison’s wishes, Harrison adopted a divisive strategy of making an agreement with tribes who were willing to sell their land, then using their agreement to pressure unwilling tribes to sign the treaty. Harrison’s strategy was successful – the Pottawatomi persuaded the Miami to sign, Miami Chief Pacanne then persuaded the Wea to sign, and the Wea then persuaded the Kickapoo to sign. Thus the Treaty of Fort Wayne was finalized by the spring of 1810. However, many of the Shawnee as well as members of different tribes rejected the treaty. In August 1810, a Shawnee chief named Tecumseh, who opposed any further Indian accommodation with white encroachment and aspired to bring about an independent Native American nation in the Old Northwest, brought 400 warriors to a meeting with Gov. Harrison at Vincennes, Ind. At the meeting, Tecumseh pronounced the new treaty to be illegitimate and warned that any attempt by whites to settle the newly acquired lands would be met with war, in which Tecumseh said he would seek an alliance with Britain. This led to the outbreak of Tecumseh’s War in 1811, a two-year conflict that overlapped with the War of 1812. The most memorable – and first regular battle – of the war was the Battle of Tippecanoe on Nov. 6, 1811. In response to Tecumseh’s plans to wage war, Harrison led an army on a mission to destroy Prophetstown, Ind., capital of Tecumseh’s confederacy. Tecumseh’s brother Tenskwatawa, an influential Indian holy man known as “the Prophet,” then attempted a surprise attack on Harrison’s camp, but Tenskwatawa was defeated, and Harrison’s men destroyed Prophetstown the following day. Harrison’s victory gave him his nickname of “Tippecanoe” – a reputation he would ride all the way to the White House in the presidential election of 1840. With the outbreak of war against Britain and Britain’s Native American allies, Illinois Territorial Gov. Ninian Edwards became convinced that the Indian tribes of Illinois would enter the war on Britain’s side. Edwards came to that conviction following the massacre at the Battle of Fort Dearborn (Chicago) on Aug. 15, 1812, where the Pottawatomi and Winnebago obtained a complete victory and burned down the fort. Among the slain at Fort Dearborn was well-known Indian agent and scout William Wells, an adopted member of the Miami tribe (in which he had the name “Apekonit”), son-in-law of Miami chief Little Turtle who had fought the U.S. during the Northwest Indian War. Ninian Edwards (1775-1833) was the first and only territorial governor of Illinois, serving from 1809 to 1818, and the third state governor of Illinois, serving from 1826 to 1830. Aiming to prevent Native American alliances with Britain, in Oct. 1812 Edwards personally led a small force from southern Illinois north to Peoria Lake, attacking and destroying a few Kickapoo and Pottawatomi villages, including villages of Pottawatomi chiefs Gomo and Black Partridge in the area of Upper Peoria Lake, and that of Kickapoo chief Pemwotam (the latter’s village being located on Peoria Lake in present day Fondulac Township, Tazewell County). In a second attack, Edwards sent Capt. Thomas Craig to Peoria Lake, where Craig attacked the French settlers and their Native American neighbors and relatives living at La Ville de Maillet (Peoria). 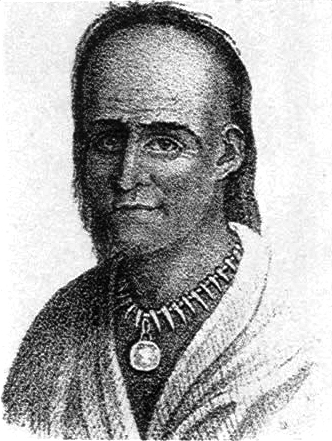 Even though the French were U.S. citizens, because they were on good terms with the Pottawatomi Craig claimed they were supplying the Indians with guns – so he set fire to La Ville de Maillet, slaughtering many inhabitants and taking the survivors prisoner, taking them downriver to Alton. These atrocities were later condemned by Congress and the French survivors were compensated for their losses. 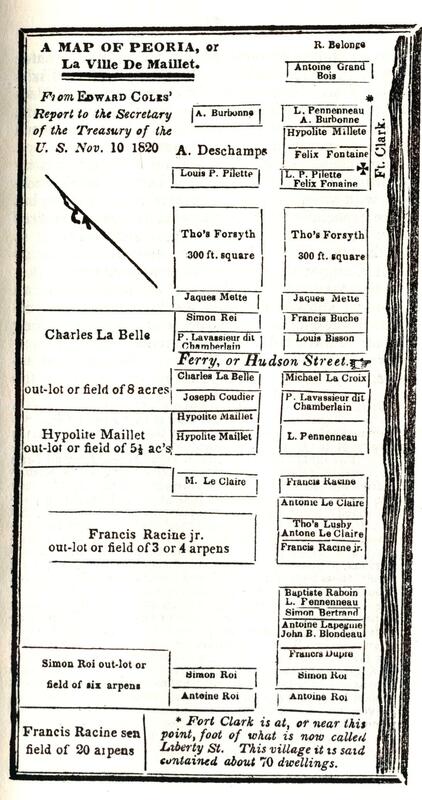 This diagram-map from S. DeWitt Drown’s “Peoria Directory for 1844” shows the layout and land-ownership of the old French-American village of La Ville de Maillet (Peoria) in 1812, just before it was destroyed by Illinois militia during the War of 1812. Many of the residents were slain in the attack, but some escaped while most survivors were taken prisoner and carried down to Alton, Ill.
Edwards’ unprovoked attacks angered the U.S. government because the Indians of Peoria Lake were considered to be friendly, some of their chiefs having declined to join Tecumseh’s confederacy (Black Partridge had even helped the Kinzie family escape at the Battle of Fort Dearborn). As a result, the native tribes of this area became hostile to all white settlers, Black Partridge became a British ally, and Gov. Edwards, now out of favor with President James Madison’s administration, found it advisable to move to Kentucky until the end of the war. The following year, Illinois militiamen and U.S. troops returned to the ruins of La Ville de Maillet, where they drove out all Native Americans and built Fort Clark (named for Revolutionary War hero George Rogers Clark) at what is now the corner of Water and Liberty streets in Peoria. Fort Clark was the nucleus of the present day city of Peoria. As for Gov. Edwards, once the War of 1812 had ended, he managed to get himself reappointed as Illinois Territorial Governor in 1815. In the next three years, Edwards oversaw the process of turning Illinois from a territory into a state. We’ll tell that story next time. The map from Gov. Edward Dunne’s 1933 “History of Illinois,” vol. I, shows the Illinois counties and the locations of Native American tribes in 1812.